BARTLESVILLE —God moved in the lives of those in Costa Rica, but I saw Him move in the lives of our East Cross students as well when our Volunteers In Mission team served there this summer. Our VIM team of 25 people included 11 students. We flew into San Jose on July 8, arriving on a sunny afternoon. We had no idea what was in store for us that week, but we were trusting God would bless our mission. We were exhausted from waking up at 3 a.m., yet our students were wide-eyed looking at the Costa Rican landscape. We partnered with Rice and Beans Ministries to serve in and around San Jose, helping teach kids about God and handing out bags of food to people in need. Each of our students served in a different group, with adults and students from other churches around the world. Most seemed a little uneasy at first about working with strangers, but they were willing to step out of their comfort zones for the Kingdom of God. I watched as the students from our Oklahoma church interacted with the children of Costa Rica and learned the kids were just like children from our part of the world. They just wanted someone to care about them and to live life with them. The living conditions astounded us in the communities where we handed out food. Most homes didn’t have actual front doors. Instead, boards covered door openings, and the residents slid them aside when they left their houses. The girls in our Bartlesville-East Cross group were forever changed by the faces of the people to whom they gave food. The people were in such need, and our missioners got to pray with them, helping them not only with their physical needs but also their spiritual needs. I know this because of our students’ stories about their encounters. I could fill this page with stories of the missioners’ experiences; come to East Cross and talk to them. I encourage you to find a way to serve God’s mission. 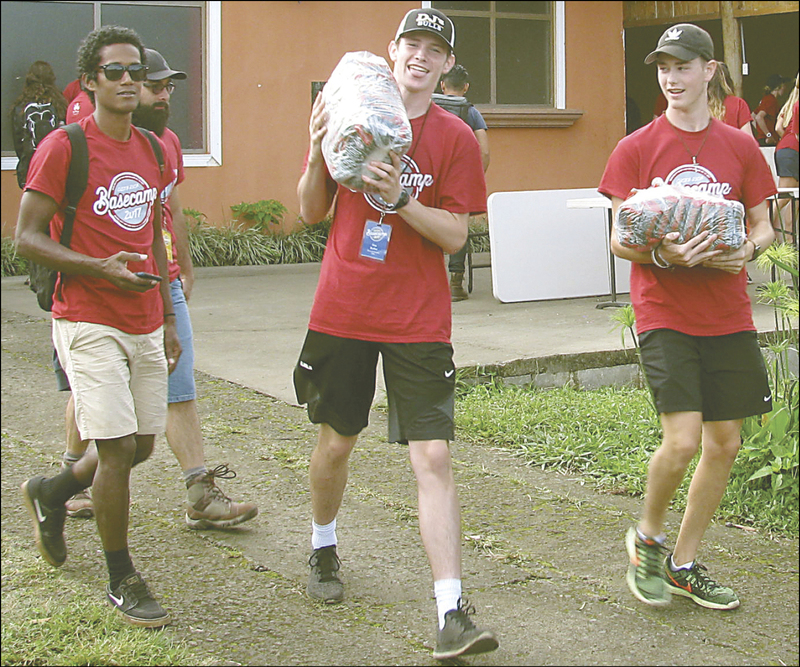 From left: Jeudy Carranza of Costa Rica and Dax Butler and Zach Robertson from East Cross United Methodist Church in Bartlesville carry supplies during a VIM service project in Costa Rica in July.